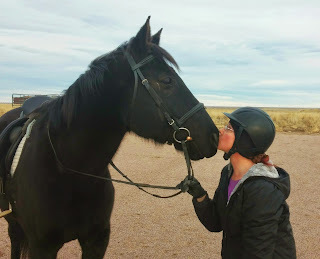 Every now and then, the horses offer such a profound experience that it's Truth opens your Heart and causes your Soul to swell with Light & Love. I share their latest Life Lesson for us all below. 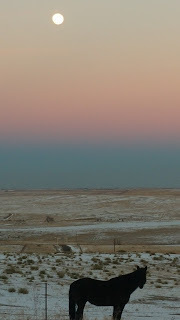 It started innocently one dusky evening, with a simple wish: To reconnect with Legacy, one of my more "troubled" relationships. I decided to begin reconnecting by moving his feet, but he wasn't interested. So I took his cue, and we just stood in stillness together. In that stillness, an entire world of LOVE & TRUTH opened up, beneath a glowing moon. As we breathed together, Legacy showed me his deepest wounding, of how, in his previous home, he had disconnected from his Soul Self, becoming way too serious & defended, way too young. It came about by having too big a responsibility at too young an age: Being asked to safely carry a too-green rider, while being too green himself. So he dissociated from his body. With predictable results. He became spooky, unreliable. Unsafe. This traumatized his owners and himself. And with each new incident, a pattern of Untruth became etched in his body and heart. As we stood acknowledging what had been, he showed me his grief at not being able to turn things around with humans, at being misunderstood, for not being SEEN for who He really was. I shared my own deep sadness, in having added yet more layers to the cycle, after he arrived to be with us. We shared the grief of "losing" the Self. Then, Legacy asked for help in reconnecting with his Essence. Of course! As we stood side by side, his True Self easily flowed in. And I saw him as He truly IS for the first time. And I laughed and giggled and laughed some more! 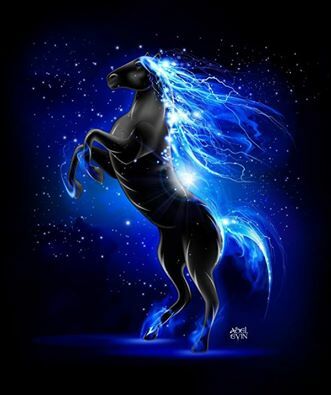 His soul is filled with JOY, and it came in as brilliant BLUE SPARKLES dancing through his body, down to his toes. As the joy flowed through us both, we giggled & giggled even more! His Truth is about Laughter & Joy & Play, which honestly surprised me, given how he generally shows up, all stoic, serious and removed. But his Essence had been covered by his earlier wounding, like happens with so many of us Humans as well. So, we stood in that sparkling blue JOY together, and I placed my cheek on his cheek, enjoying each other in Love, for many magical minutes. And in that Loving Connection he reminded me of his Soul's Purpose. His deepest longing was simply to be In Joy with his human partner. To be that person's Joy. To be that thing that brings Light & Joy & Laughter into someone's life. How profound. This precious moment of Revelation. At the core, isn't that what EVERYONE wishes? To feel the joy of bringing a sparkle into another person's heart. To know the deep worthiness of being Seen, Appreciated, EN-JOYED? Why should the horses be any different? And so, Legacy reminded me, it doesn't much matter what we DO with his body, as long as what we BE together, is JOY. I responded by wrapping his body up in a joyful hug and held on tightly. Just then, my other "troubled relationship" walked over, as Little Man joined us in the moonlight. Over the fence Little Man gently grabbed stuck energy off my head, and yawned, releasing it. Doing this several times, he helped me further anchor these new energies into my body. And then both geldings offered me a Gift: They both laid down. These two beautiful beings, neither of whom I normally feel perfectly SAFE with, invited me into the experience of Ultimate Trust & Surrender. I laid down on the ground with each of them. And surrendered the untruths that have been standing between us, keeping us apart. And under the glowing moon on a warm summer night, I allowed in the Truth: That I am blessed by having these powerful beings in my life. That we are together to remember the deepest truths about Who we are. That each of us is LOVE. That it's time to let go of and lay down everything that has covered up our Love. So that once again, we can know ourselves and each other as LOVE. Indeed, it's a A Magical Moonlight Message for One & All. What can we lay down now, to reveal the Truth of our Love? Let's return to the Highest Truth of our Love & Light. May we ALL BE LOVE, together. ~ What Untruths are you holding about yourself as a result of pain in your past? What Untruth are you ready to surrender now? Who would you be without that Untruth? Can you ask for and allow that energy into your body now? How will it FEEL to BE that Truth in relationship to yourself, others, the world? What one action can you take to anchor your Truth into your Being today? Everyday? ~ What outdated Illusion or Untruth are you holding about another being in your life, that is anchoring an unpleasant experience into both of your realities? What can you do to uncover and allow the Truth of them to emerge so that both of your experiences can shift? ~ Very often, when one being of a partnership needs healing or uplifting, so does the other, and when BOTH show up willing to transform, magic happens. As in this story, Legacy reclaiming his joyful sparkle allowed me to reclaim aspects of my Joy & Sparkle as well. I felt this reverberate through my being consciously for more than a week! We sometimes do ourselves and other beings a dis-service by offering "healing" without also being willing to receive "healing." How can we be open, in every moment, to giving and receiving the wisdom, love, and light of the universe? How can we be channels for love and light to flow through and to us, with all beings we meet? 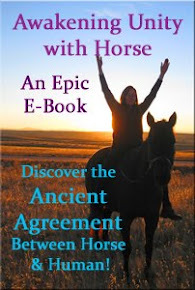 How can the exchange of energy EXPAND us both, in an ever-enlightening spiral upward? ~ Just like humans, horses have an Essence and a Purpose and they thrive when you can SEE them and HONOR them for what they Truly Offer. One of the deepest pains for ANY being, horse or human, is to NOT BE SEEN for what they ARE & OFFER. Or, to not be given the opportunity to live & BE their purpose. 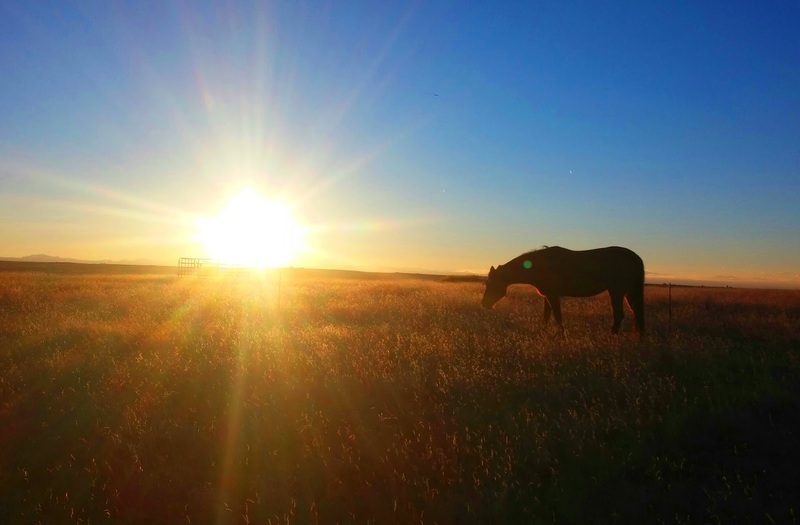 What can you do to honor your horse's purpose and essence? Would some shifts in their activities or relationships, make a whole new level of Honoring possible? Unsure of what your or your horse's True Life Purpose is? 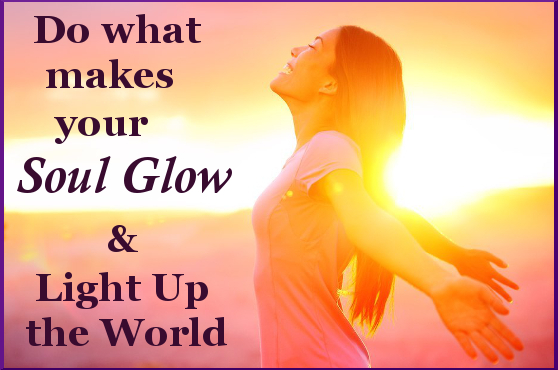 Soon, Dr. Jenn will be offering SOUL GLOW sessions that enable you to tap into and activate your current Life Purpose, so you and/or your horse can live your most fulfilled, satisfied and Passionate Purpose with Ease and Grace. Thank you for being with us Anna! 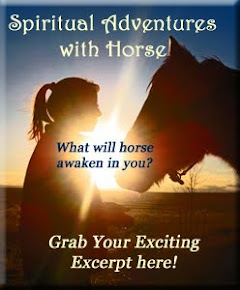 Blessings on your journey with horses! Thank you Legacy and Dr. Jenn for being willing to share so deeply and to reveal your sparkly essence so I could find the twinkling within me. Blessings!